Click the images for a larger version. Click 'Close' or press ESC to return. So far all of the systems we have looked at have been synchronous systems. This needs very good speed control at both ends, and some means of correcting any lack of synch. Around 1906, Jay Morton and Charles Krumm of Chicago started experimenting with machines that worked on what is known as the start-stop principle. It still used a five unit code, like the Baudot and Murray systems, but the transmitters and receivers come to rest when not actually processing a character. To send a character, first a 'start' element is sent to line. This starts the receiver going. Next come the five code elements, and finally a 'stop' element. The stop element can go on until the start of the next character, but it has to have a minimum length to let the receiver come to a halt. So minor speed differences between ends are automatically put right at the start of each character. This means simpler governors and no need for special synch signals. When these machines started arriving in Britain, Creed lost no time in meeting the challenge with a whole series of machines. Starting with the Model 1P page printer, left [Picture: BT Archive], then the 2P and finally the Model 3 tape printer, Creed’s first combined start-stop machine, was introduced in 1927 for the Post office telegram service. 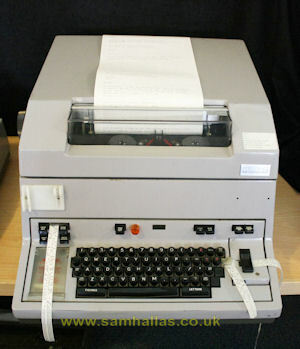 The famous model 7 page printing teleprinter, below, came in 1931 and was used for the inland Telex service. It worked at a speed of 400 characters a minute, about 66 words a minute, using a code based on the Murray code. 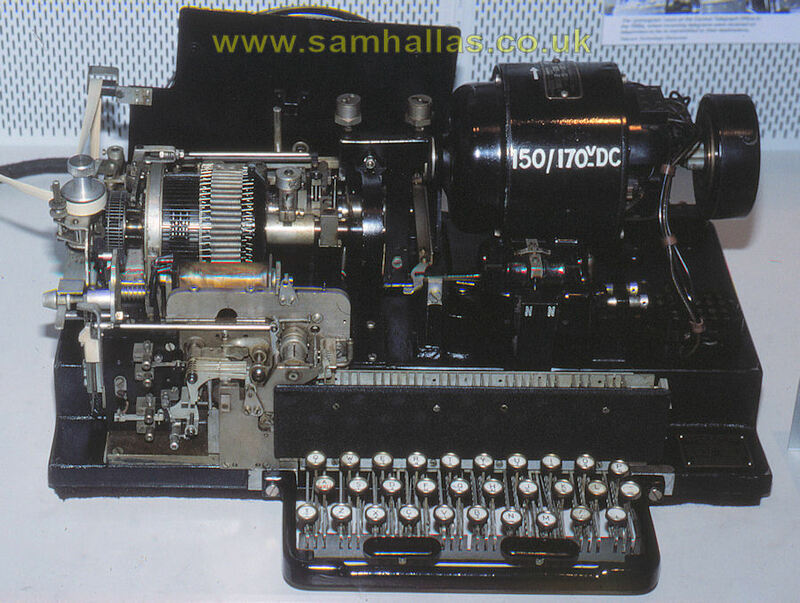 It was later recognised as International Telegraph Alphabet No 2 - the one still in use today for Telex and RTTY. 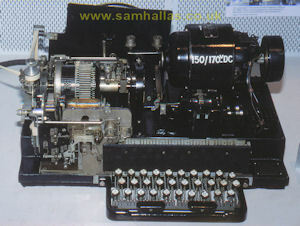 Over the years, many fine teleprinters, such as the Model 444 illustrated, have been produced by Creed in Britain, Teletype in America, Siemens and Lorenz in Germany and Olivetti in Italy. All of these machines work on similar principles. They have not changed much since the 1930s, except in matters of individual detail. 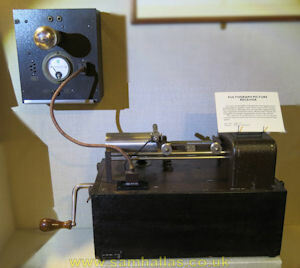 The first transmissions used hand sent Morse code, but so as to get as much traffic over the air waves as they could, the telegraph companies were soon using automatic transmitters and receivers - and later, printing teleprinters. 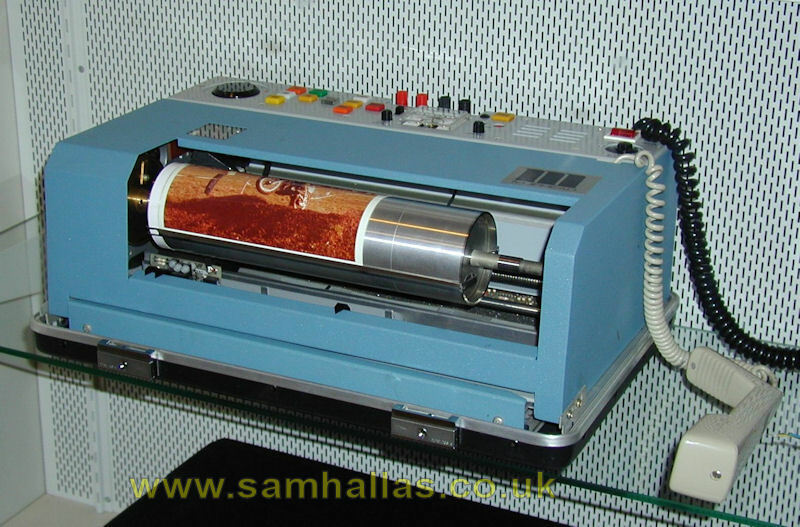 We have looked at telegraphy, sending letters, character by character, but what about facsimile transmission, or FAX, sending pictures by wire or radio? 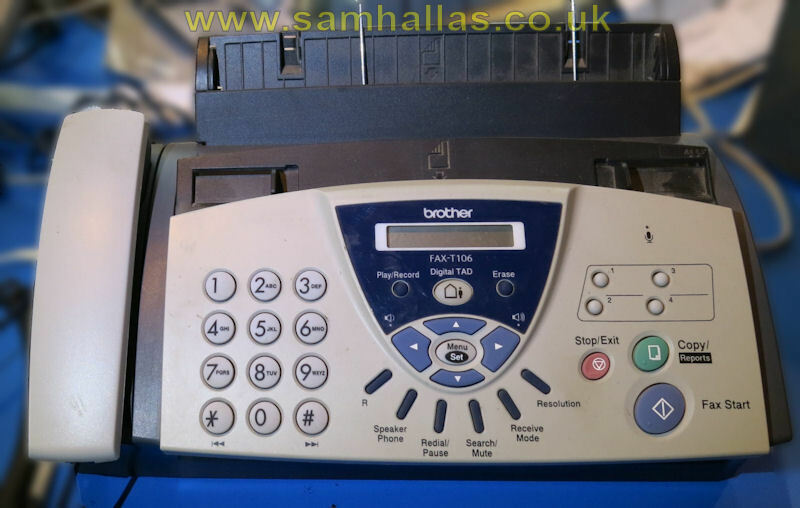 It comes as something of a surprise to find that FAX has a history nearly as long as telegraphs. The first working system was invented by Alexander Bain - who invented the Morse recorder mentioned earlier - as long ago as 1842. Bain had invented a system of synchronised clocks and he saw that the pendulums, linked together electrically, swung together, reaching the ends of their swings simultaneously. 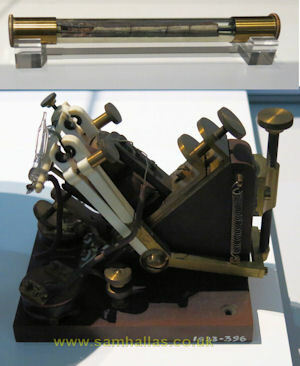 By fitting a contact at one end, moving over letter shaped contacts and a stylus at the other end, he was able to reproduce the patterns of the letters at a distance. The stylus moved over chemical coated paper and the paper was moved forward on each swing, so tracing the shape of the letters. 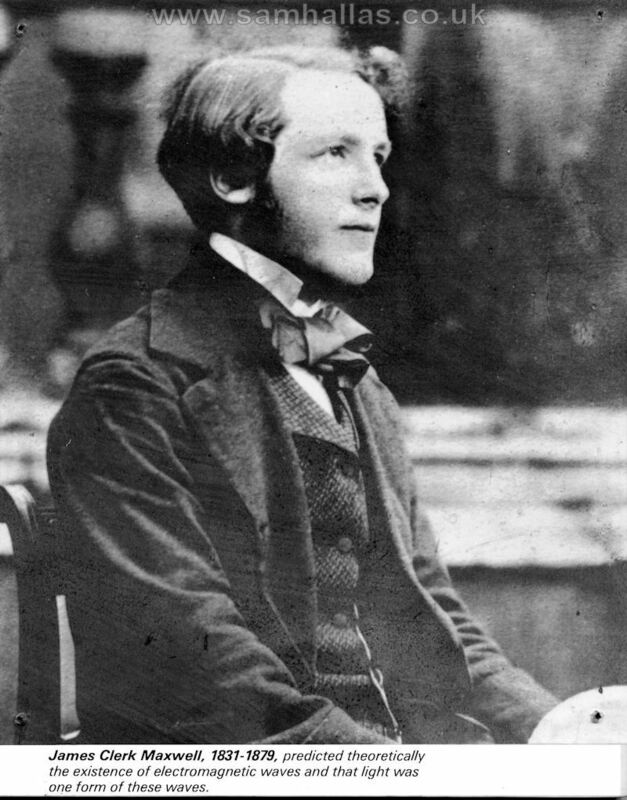 Its success was limited and in 1850, Frederick Bakewell's invention of a cylinder and screw, rather like the phonograph cylinder, set the pattern for later FAX designs. 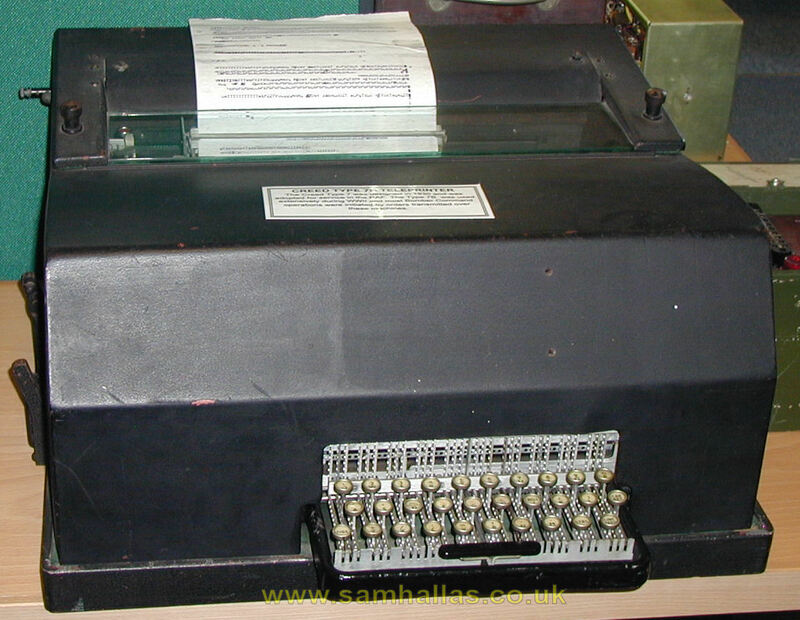 The real advance in FAX was the discovery of the light sensitive properties of selenium. In 1902 Dr Arthur Korn made the first photoelectric FAX for transmitting photographs and in 1921, Edouard Belin used equipment like this to send pictures across the Atlantic. 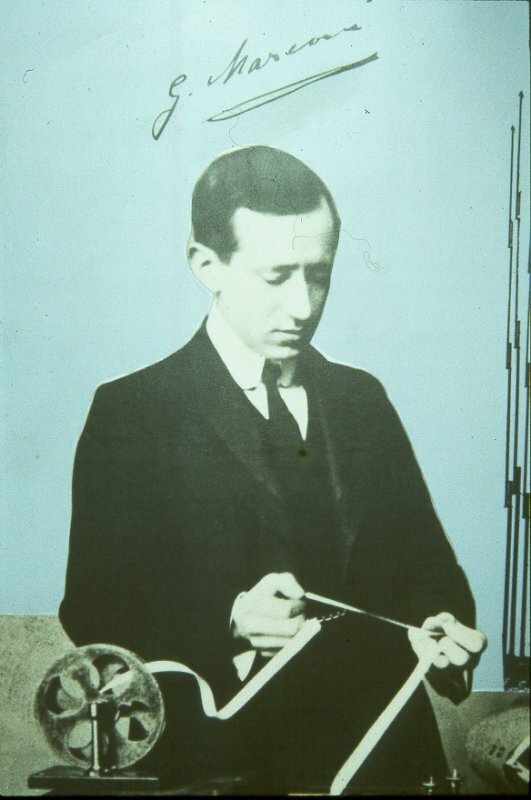 The first radio FAX transmission across the Atlantic took place in 1928. FAX has moved along with technology, driven by the needs, mainly, of the newspaper business. Improvements such as white space skipping, and run length coding have speeded things up. 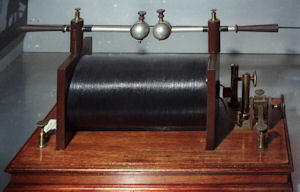 Even comparatively recently, machines from Muirhead and others still used the basic revolving drum technique, though pictures are now sent in colour - originally by three separate transmissions, later by simultaneous transmission. FAXs today use raster scanning, like a television picture, and print on heat sensitive paper or use ink-jet or laser-jet technology. Anyone who has ever used a radio will know that they suffer from noise. What happens to a data transmission is that the wrong characters are received. Now, with ordinary text, enough is still left for the human brain to make some sense of it. But if there is a mistake in coded text or pure data, of course, there is no way of guessing what the right letters should have been. 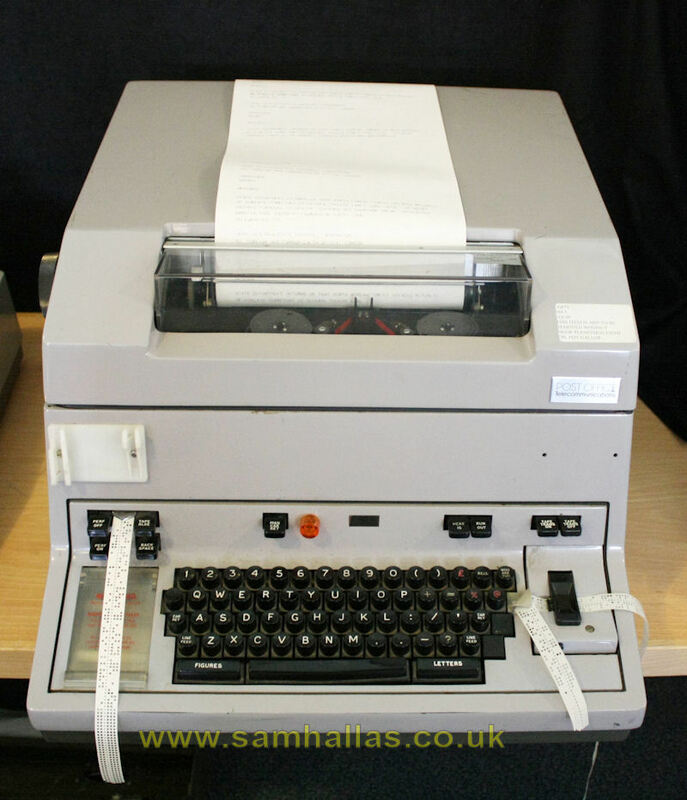 A fairly simple way of correcting errors was called Telex Over Radio, better known as TOR. 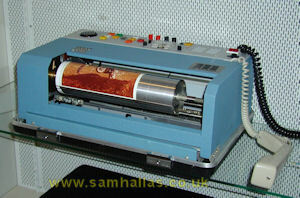 This was developed in the early 60s for long haul radio circuits and for sending telex to ships. If the receiver spotted an error it signalled back to the sender and the characters were sent again. 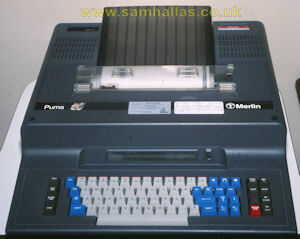 The commercial SITOR (Simplex telex over radio) was adapted in the 1980s by Peter Martinez, G3PLX, to make a system for amateur radio teleprinting, called AMTOR. Nowadays, integrated circuits and microprocessors have made it possible to send data by radio for all sorts of jobs, without the errors caused by poor reception. Here are a few examples. The public utilities often have plant in the middle of nowhere. Radio telemetry lets them read instruments, and work controls from the comfort of a central control room. Many people now have a television set with Teletext. The data is coded onto spare lines in the television frame to broadcast an electronic magazine. 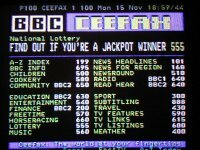 Launched as Ceefax by the BBC in 1974, the service was the first in the world. It was finally shut down in October 2012 with the end of analogue TV broadcasting in Northern Ireland. 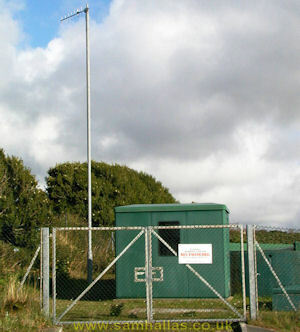 It is now possible to connect portable data terminals, computers, or even FAX machines via the cellular radio network. One can now get straight through to the company's mainframe, wherever one happens to be. Combinations of Forward Error Correction (FEC) and Automatic Repeat Request (ARQ) virtually guarantee an error-free connection. Of course, once the mobile networks went digital, modems were no longer needed and the signalling protocol provided all the error correction. A good example I can quote is that Network Rail use a secure radio data system to keep the safety of single line working using an electronic token system without the expense of laying cables to the furthest flung parts of the network. Radio Electronic Token Block (RETB) working will eventually be superseded by the European Rail Traffic Management System (ERTMS), but it was still in service in 2014 and expected to last for a good few years afterwards. 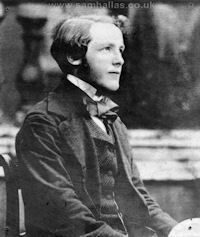 We have come a long way from Wheatstone, Baudot, Morse, Creed, and Marconi, but we hope that you will remember when the talk turns to packets and satellites that it all goes back to the pioneers who had the vision of communicating round the world that has put us where we are today. This article is a written version of an illustrated lecture prepared as part of the data communications symposium held during the Radio Society of Great Britain's 50th anniversary in 1987, organised by BARTG. Thanks are due to many people, especially British Telecom plc for permission to use some of the illustrations. 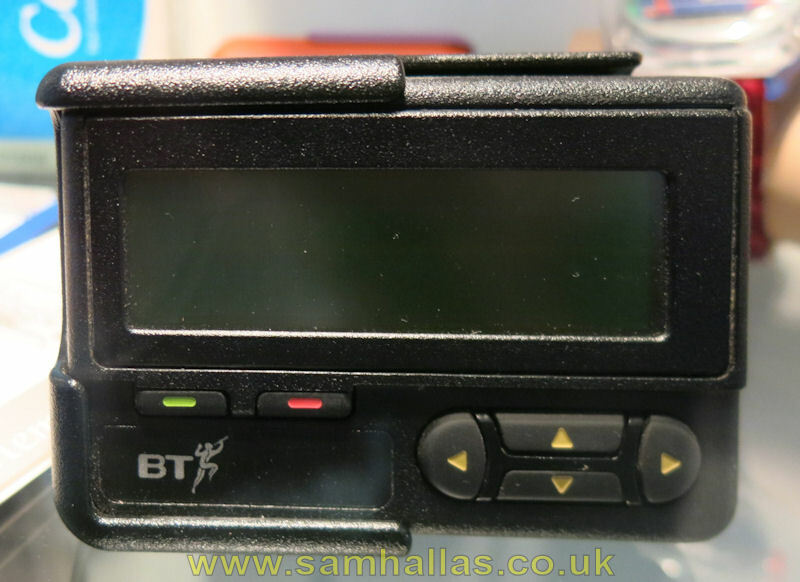 The resources people at the BT Museum were most helpful and advised on the choice of pictures. Thanks especially to Smudge Lundegard, G3GJW, for his help and encouragement. Unless otherwise acknowledged, the photographs are by Sam Hallas. 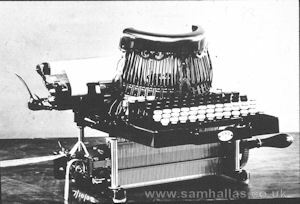 In 2014, some 27 years after the original text was written, I thought it was time to review the progress in telegraphy and telecommunications in general in the intervening period. These articles copyright 1987-2014, AG Hobbs & SM Hallas.